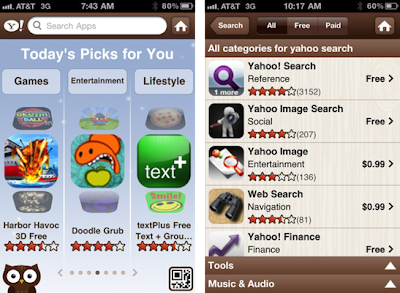 On February 1st, 2012 Yahoo has launched a new search engine for iPhone and Android apps, enabling users to track down new services and access reviews. The company's new search engine works similarly to its web search, by sorting through the iPhone and Android apps on the basis of keywords or search terms input by users. The App Search tool collates 350,000 apps from Apple's App Store and 200,000 apps from Google's Android Market, listed by device, price and category. Users can also filter the results by category, such as free or paid-for, and can then download the apps directly from the relevant outlet, by clicking “send to phone”, which sends a text message with a hyperlink the user’s phone, or by scanning a QR code, which directs the user to the relevant destination. "Only Yahoo App Search has both the search technology and is device agnostic so can offer users a choice of both Android and iPhone," said James Gammon, Yahoo search product marketing manager. Moreover, advertisers can also promote their apps by bidding on relevant keywords with the ads being returned next to the organic results. 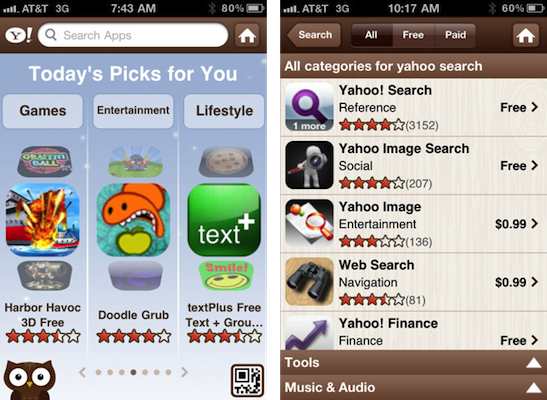 "Yahoo App Search not only makes it easy to find and download apps that you are looking for but also discover new apps." You can try Yahoo! App Search from here and download the Yahoo! AppSpot App from here.